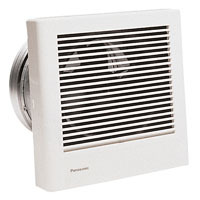 Panasonic Ventilation Exhaust Bathroom Fans. Energy Star® qualified with user-friendly installation. Extremely quiet and prevents heat from escaping and backdraft. WhisperWarm™ Ceiling Mounted Fan/Heat Combination. 110 CFM unit equipped with stainless steel-sheathead heating element that features Nichrome wire and magnesium oxide. Blower wheel is designed to draw in air from both sides, helping to keep the noise down. Built-in damper to prevent backdraft, but also prevents heat from escaping. 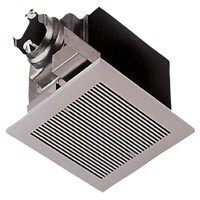 WhisperWarm™ Heat/Vent/Light Bathroom Exhaust Fans. Stainless-steel heating fan featuring Nichrome wire with magnesium oxide. Sirocco blower wheel is designed to draw air in from both sides insuring to keep the noise down. Trouble-free operation with built-in damper to prevent backdraft. WhisperLite™ Ceiling Mounted Fan/Light Combination. 80 CFM made with high-quality components and permanent lubricated motors. Easily detachable from housing with uncomplicated wiring. User-friendly installation with a double-hanger bar system. WhisperLite™ Ceiling Mounted Fan/Light Combination. 90 CFM with Sirocco fan. Designed to have extended service life with using less energy. Grille can be detached quickly from the main unit. 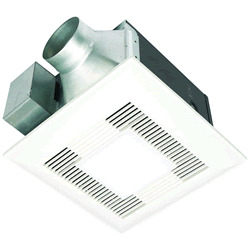 Energy saving ventilation fan that uses two 13 Watt fluorescent lamps with almost the same illumination as a regular 100 Watt incandescent lamp. WhisperLite™ Ceiling Mounted Fan/Light Combination. 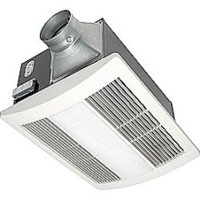 80 CFM that ventilates and provides overhead lighting in the room. Provided by super-quiet operation and high CFM to Watt efficiency. Large wheel turning slower than a small fast fan for airflow and less noise. Uses a wide-blower wheel that can move a large amount of air at reduced RPMs. WhisperLite™ Ceiling Mounted Fan/Light Combination. 80 CFM with quiet operation at .25" Water Gauge. One 32 Watt Compact Fluorescent lamp gives off plenty of overhead lighting. Built-in damper to prevent backdraft, but does not create excessive heat. WhisperLite™ Ceiling Mounted Fan/Light Combination. 110 CFM ventilating sirocco fan driven by capacitor motor. Designed to have extended service life and reduce energy consumption with thermal-cutoff for safety. An energy-saving lighting device which uses two 13W fluorescent lamps which is equivalent to the same illumination as a standard 100W incandescent lamp. WhisperLite™ Vent/Light Bathroom Exhaust Fan. Ventilates air in room and equipped with a 4 Watt nightlight. Enclosed condenser motor and double-tapered bladed blower wheel moves air with ease. Designed to give you continuous, trouble-free operation. Made with heavy-gauge zinc galvanized steel to protect from rusting. WhisperLite™ Ceiling Mounted Fan/Light Combination. Detachable adapters, adjustable mounting brackets up to 26", and secured duct ends. 13" grille and a condenser motor. Operates at lower temperatures increasing life of the motor and bearings. 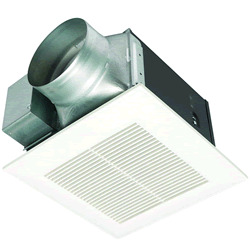 WhisperCeiling™ Ceiling Mounted Bathroom Exhaust Fan. 50 CFM with a quiet operation at .25" Water Gauge. Enclosed condenser motor and double-tapered bladed blower wheel to move air quietly. 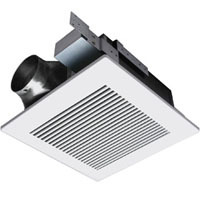 User-friendly installation with detachable adapters, secured duct ends, adjustable mounting brackets that go up to 26", and fan/motor unit detaches easily from housing. WhisperCeiling Ceiling Mounted Fan. 90 CFM that's designed to fit in 2" x 6" joists or larger. 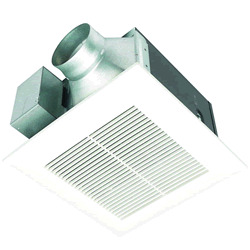 Blower wheel is designed to draw air from both sides which helps keep noise down. Easy to install and detach from housing and adapters. Featuring a double-hanger bar system for ideal positioning. Made with heavy-gauge zinc galvanized steel to protect from rust. 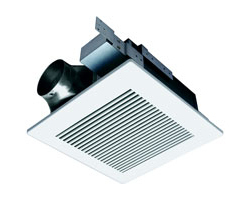 WhisperCeiling™ Ceiling Mounted Bathroom Exhaust Fan. 80 CFM with built-in damper to prevent backdraft coming through the fan. Detachable adapters, secured duct ends, adjustable mounting brackets that go up to 26", uncomplicated wiring for easy installation. Trouble-free operation with high quality components and permanent lubricated motors. WhisperCeiling™ Ceiling Mounted Fan. 110 CFM with enclosed condenser motor and a double-tapered bladed blower wheel that quietly moves air with less RPMs. Trouble-free operation with its high quality components and permanently lubricated motor that wears at a slower pace. Detachable adapters with firmly secured duct ends, adjustable brackets that go up to 26", uncomplicated wiring and fan/motor units that detach from housing. 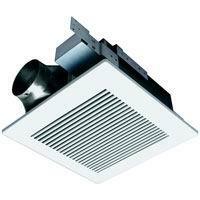 WhisperCeiling™ Ceiling Mounted Bathroom Exhaust Fan. 110 CFM user-friendly installation, quiet operation with .25" water gauge. Continuous trouble-free operation with high-quality components and permanently lubricated motors. This design operates at lower temperatures increasing life for the motor and bearings. WhisperCeiling™ Ceiling Mounted Bathroom Exhaust Fan. 150 CFM with enclosed condenser motor and double-tapered bladed blower wheel that moves air quietly. .25" Water Gauge to insure quiet operation. Continuous trouble-free operation for many years with lubricated motors that wear at a slow pace and operates at lower temperatures to increase life for the motor and bearings. Double-hanger bar system for your own positioning. WhisperCeiling™ Ceiling Mounted Fan. 190 CFM with an enclosed condenser motor and a double-tapered bladed blower wheel to move air quietly with less RPMs for less noise. Made from heavy-gauge zinc galvanized steel to protect from rust. With user-friendly installation, it's easy to detach adapters and fan/motor units from housing, uncomplicated wiring, secured duct ends and adjustable mounting brackets. This fan also prevents backdraft with a built-in damper. WhisperCeiling™ Ceiling Mounted Fan. 290 CFM with an enclosed condenser motor and a double-tapered bladed blower wheel to move air quietly with less RPMs for less noise. Made from heavy-gauge zinc galvanized steel to protect from rust. With user-friendly installation, it's easy to detach adapters and fan/motor units from housing, uncomplicated wiring, secured duct ends and adjustable mounting brackets. Also featuring a double-hanger bar system for your ideal positioning. This fan also prevents backdraft with a built-in damper. WhisperCeiling Ceiling Mounted Fan. 380 CFM with an enclosed condenser motor and a double-tapered bladed blower wheel to move air quietly with less RPMs for less noise. Made from heavy-gauge zinc galvanized steel to protect from rust. With user-friendly installation, it's easy to detach adapters and fan/motor units from housing, uncomplicated wiring, secured duct ends and adjustable mounting brackets. Also featuring a double-hanger bar system for your ideal positioning. This fan also prevents backdraft with a built-in damper. 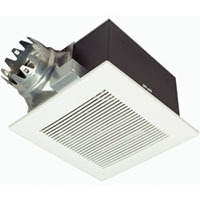 WhisperFit™ Low Profile Ceiling Mounted Fan. 50 CFM 2" x 6" joists for a small cavity in your ceiling. Equipped with double suction blower wheel to quietly move air. No backdraft with cool running motors, yet, does not create excessive heat! 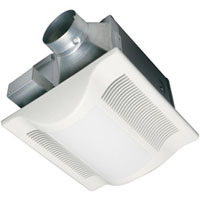 Easy installation with detachable adapters, uncomplicated wiring, firmly secured duct ends, adjustable mounting brackets that extend up to 26" and detachable fan/motor from housing. 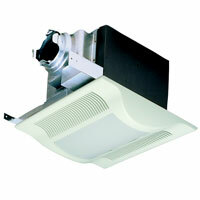 WhisperFit™ Low Profile Ceiling Mounted Fan. 70 CFM ventilating fan model with low noise sirocco fan driven by a capacitor motor. Extended life with reduced energy. Incorporated with a thermal-cutoff for safety. Spring-loaded grille that is easy and quick to remove. 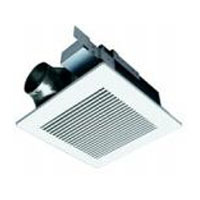 WhisperFit™ Low Profile Ceiling Mounted Fan. 90 CFM using a low noise sirocco fan driven by a capacitor motor. Designed to have an extended life using less energy. Incorporated with thermal-cutoff for safety. Spring-loaded grille that is quick and easy to remove. Damper for preventing counterflow is included. 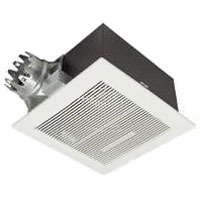 WhisperFit™ Low Profile Ceiling Mounted Fan. 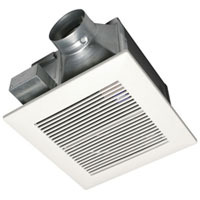 110 CFM for 2" x 6" joists in your ceiling for small cavities or larger. Features an enclosed condenser motor and a double suction blower wheel to quietly move air using less RPMs. Trouble-free operation that is easy to install. Includes a double-hanger bar system for your own ideal positioning. WhisperWall™ Wall Mounted Fan. 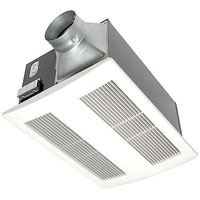 70 CFM and designed for through-the-wall ventilation where ceiling mounting fans are not possible. Backdraft damper included. Wide blower wheel that moves a large amount of air at reduced RPMs. Operates at lower temperatures to increase the life of the motor and bearings. Made of heavy-gauge zinc galvanized steel to protect from rust.